Designed by a Navy SEAL as a go-anywhere workout, the TRX Suspension Professional Trainer is a complete total-body training tool that helps athletes, military personnel, and fitness pros around the world take their performance to the next level. 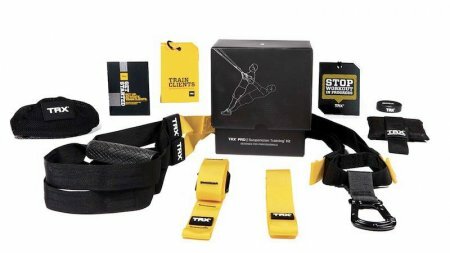 The TRX Suspension Professional Trainer is built around a set of nylon straps that create resistance from two sources always at your disposal: your body weight and gravity. Simply lock the straps to any elevated fixture--such as a pull-up bar, door, or tree branch--and you'll unlock new dimensions in your training. The TRX Suspension Professional Trainer uses your body weight to create resistance. The trainer offers a host of valuable benefits: it's easy to set up and highly portable, with a compact, lightweight design that works at home or on the go. If the gym isn't your thing or you want to work out in the privacy of your home, backyard, or hotel, this practical solution will make sure you can stay fit. It also lets you perform hundreds of functional exercises, so you can build strength, flexibility, core stability, and endurance. Perhaps most importantly, the TRX Suspension Professional Trainer supports all fitness levels and goals. By letting you harness your own body weight to create resistance, you can easily adjust the degree of difficulty (from 5 to 100 percent of your body weight) whether you're a beginner or an experienced athlete. The TRX Suspension Trainer Professional starts with a pair of nylon straps, each of which features an integrated foot cradle for ground-based training along with a club-grade grip.